****Brand New Range For 2009**** According to the RAC more than 40 people die on our roads every year because of defective or improperly inflated tyres. Scores of others are injured. Tyres are the only point of contact a car has with the road. It is therefore vitally important for motorists to check their tyres regularly. Maintaining correct tyre pressure has benefits other than safety. Under or over inflated tyres suffer more damage than those with the correct pressure and need to be replaced more regularly. Under inflated tyres increase the rolling resistance that require more fuel to maintain the same speed. Correct tyre pressure also benefits the environment by maintaining optimum fuel efficiency, and reduces CO2 emissions. 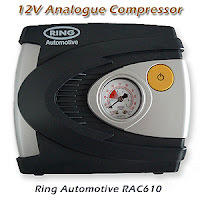 To help motorists maintain optimum tyre pressure, Ring Automotive has launched a new range of compressors. The range incorporates Ring's award winning compressor technology. Analogue and digital compressors are included to suit individual motorist's needs from DIY enthusiasts through to professionals. Neat tidy storage for fused 12v cigarette lighter plugs and the flexible air hoses means that all the compressors will store away easily in the car. To get the maximum performance and life from car tyres, motorists should check their tyre pressure regularly. The new Ring Automotive Compressors are an invaluable accessory to have the car. This little tyre pump is unbelievable value for money. Having read this you can stop right here, but I can continue by saying that for £10.74 delivered to my door, what on earth was I doing all these years queuing up in the rain to feed 20p pieces into a garage forecourt machine? This pump has topped up all my car tyres, put air in the wheelbarrow that it hasn't had for years and given my mountain bike a new sprightliness now its tyres are up to 45psi. When I used my old foot pump the act of pulling off the hose would instantly lose me 10psi. This little machine comes with a 32 page instruction book with more languages than I knew existed, it has a velcro tie to keep the 3m of power cable tidy, it has lots of adapters for lilos etc, it has a silica gel packet to keep it dry and a sturdy box to keep it all in. 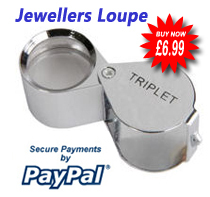 It's outrageously good value for money - less than the price of three M & S sandwiches. And, and, its in-built analogue tyre pressure gauge matches pound for pound with my far more expensive Michelin gauge.